Super durable high-volume indoor and outdoor waste management receptacle ideally suited for office buildings, shopping malls, and convenience stores. 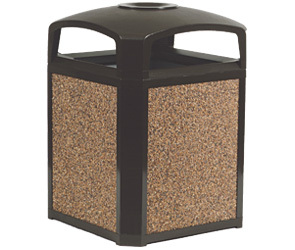 These 50 gallon waste receptacles are engineered to last, featuring a solid resin constructed Top, Base & Frame Kit that resists fading, is impervious to dents and won't leave rust stains. The stay open strap and hinged hood provides easy access to the rigid leak-proof plastic liner. These Landmark Series® waste receptacle kits are available with several versatile options designed to suit your needs. The following is the easy 3 step ordering process instructions. (A) of the Top, Base & Frame kit you would like to order. (C) of Landmark Series® complete waste receptacle kits you would like to order.